Green Britain Foundation01760 726100work Conference CentreThe Green Britain Centre hosts a range of meetings, events and conferences at their spacious timber framed building - whether you're looking for a meeting room for two or a venue for two hundred, they have it covered. With a variety of meeting rooms including a purpose built lecture theatre the GBC makes for a dynamic and bustling venue at which to hold your event or training. Their dedicated team will make sure your experience runs smoothly. Superb vegetarian and homemade conference catering alongside a fully licensed bar, the GBC offers a multiplicity of services for your event. The Green Britain Centre hosts a range of meetings, events and conferences at their spacious timber framed building - whether you're looking for a meeting room for two or a venue for two hundred, they have it covered. With a variety of meeting rooms including a purpose built lecture theatre the GBC makes for a dynamic and bustling venue at which to hold your event or training. Their dedicated team will make sure your experience runs smoothly. 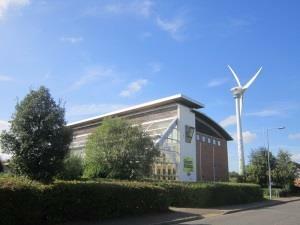 Not only a conference venue but home to the 21st century windmill in the world open for the public to climb, alongside their international education programme delivered to over 5000 students a year, visitor's centre and organic gardens, electric vehicle charge point - you're sure to find something for you.